Jazz guitarist Chuck Anderson might not be known to a wide audience despite his obvious skills to fascinate. The reason may be that the 62-year old artist's career was extensively disrupted by the theft of his Gibson L5 guitar and a severe case of obstructive sleep apnea that left him feeling like a zombie. When craftsman Eric Schulte offered to reconstruct the L5 and Anderson also found effective treatment for his sleep apnea, he was able to resume his performing career after a hiatus of quite some years. A blessing to all of us, for Anderson proves himself to be one of the finest guitarists in the business. This CD, which consists entirely of 12 original compositions, shows him to be a skilled writer and is a "sleeper" of a recording that reveals exceptional talents of an outstanding guitarist. 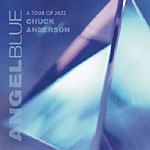 Anderson comes from the straight-ahead genealogy that moves from Charlie Christian, Les Paul and Wes Montgomery through Joe Beck, Vic Juris, and Pat Martino with a slight touch of the latter's rhythm and blues intensity. Though more laid back and less driven than Martino, Anderson is no less rhythmically quick and able to turn memorable phrases at will. The purity, precision and transparency of his execution is stunning. No wonder he grieved the loss of his L5: it must have been his soulmate. He makes his new reconstructed one his own as few musicians can do. Rarely will you hear such beauty of sound as emanates from Anderson and his instrument. Eric Schreiber on 5-string bass and Ed Rick on drums and percussion provide perfect foils for Anderson. At times Anderson and Schreiber function almost as one instrument: their playing is that well-coordinated. Rick keeps perfect time, and his strokes on the cymbals are like crystalline glass angelically touched. The songs on this CD, all composed by the guitarist, comprise a virtual suite and are of the sort that fit the guitar perfectly, being simple in statement and having an inner structure and beauty that is meant for the instrument. They evade verbal description and are compelling to listen to. Anderson's phrases flow endlessly and seamlessly throughout the recording, which is the way guitar improvising should be: each phrase evolving out of the one before it and leading to the one that follows, like the continuity of life itself. This album should be listened to by guitar masters who still want to learn how to play their instrument. Everyone else runs the risk of being enchanted by the proper expression of an instrument which has told the human story almost since the beginning of recorded history. It sure has found a worthy poet in Anderson. Track Listing: Princess of the Nile; In a Misty Glow; Mystique; Flight; Song for Coreen; Exit Blues; The Enchanted Garden; Double Dippin'; Chanson; Freefall; From the Heart; Diablo's Dream. 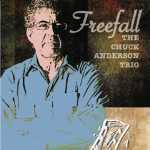 Personnel: Chuck Anderson: guitar; Eric Schreiber: 5 string bass; Ed Rick: drums and percussion.